French wood slat folding Campaign table along with four companion chairs. 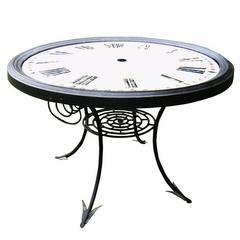 Fabulous tower clock face with hand forged iron base. Each leg finished with a golden arrow. Wrought iron basket motif side table with pink/grey colored marble top. Folding Syrian armchair with intricate mother-of-pearl inlays. Petite country French console table with two drawers and antiqued mirrored top.